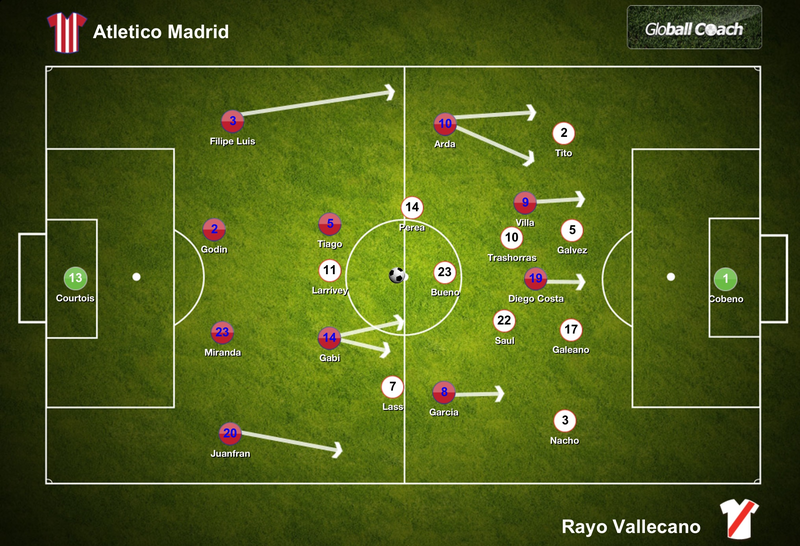 Atleti vs Rayo – Atleti Strong but Rayo Weak. 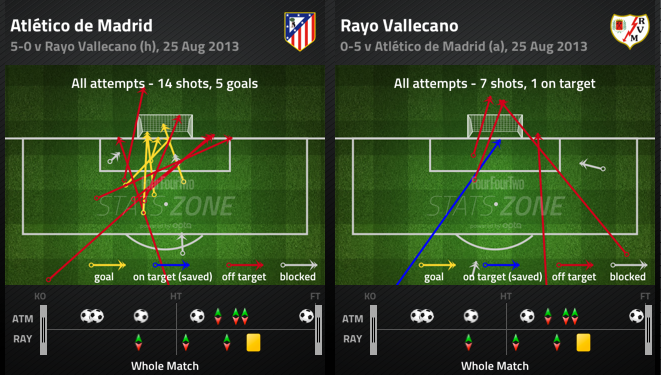 Atleti continue their very impressive start to the season with a resounding home win over a poor Rayo Vallecano. The game in some respects went entirely according to plan. Rayo tried to impose themselves on their hosts and played a very open and attack minded game and went consequently ripped to shreds by an Atleti side who are one of the most lethal counter attacking sides at the moment. Simeone made a couple of changes from the team that had drawn 1-1 with Barcelona in midweek. Raul Garcia and Tiago came into the side with Mario and Koke dropping to the bench. Paco Jemez named a starting eleven which had changed considerably since last season with players such as Leo and Piti having left the club. Saul on loan from Atleti, started the game in midfield for Rayo with former Atleti player Perea in attack. Atleti only had 44% possession in this game, completing 269 passes from 362 attempted. Would that concern Simeone? No, not at all. The objective from Simeone is to achieve something when his side have possession. To have a goal in mind and not simply have the ball and recycle possession. It has led to an Atleti side that counter superbly well with swift, incisive passing that cuts the opponent open. It has also led to an Atleti that can toil against a low block. Filipe Luis was very noticeable pushing high on the left aided by Perea moving infield. The full back was able to support attacks and repeatedly found space. The Naivety of Paco Jemez? Jemez remains true to his beliefs. Is this an act of folly or the act of a principled man? Whatever way you consider it, his game plan needs to be executed properly if it has any hope of working correctly. The key aspect of a high offside line is pressure on your opponent in their own half but Rayo simply didn’t press well enough. What emerged was a gap between the front half of the team pressing ineffectively and the defence positioned close to the halfway line. Rayo looked slow and unable to compete. That is more concerning than the failure of the offside trap. Atleti were caught offside on 14 separate occasions in the game yet just as often they broke through Rayo’s shambolic offside trap. The high line cannot explain the terrible defending that enabled Raul Garcia to have a free header after 17 minutes to open the scoring or Diego Costa to arrive at the back post a few minutes later and score the second from a cut back by Arda. The prowess of Atleti on the counter is well known as is the problems that Atleti can encounter when teams use a low block against them. Yet Jemez opted to continue with his high risk strategy and push men forward even though Atleti would provide a stern test of Rayo’s defensive capabilities on transitions. A Rayo defence substantially different from last season. Cassado, Amat and Figueras have all departed. The defence is new. Given the manner in which Rayo play, there will always be a need for an adaptation phase. Rayo encountered similar defensive frailties last season before tightening up. These issues should be resolved but you can’t help feel that the overall drop in quality will play a role too. Until that adaptation phase has proven successful, should a more conservative approach be utilised? What Jemez cannot do, however, is legislate for the poor passing of his side coupled with a lack of aggression in their play. Rayo were meek in their defeat. That is unacceptable as Jemez admitted post match. At the very least, Rayo must compete. When attacks broke down, Atleti countered swiftly and efficiently with Rayo struggling to regain shape in the transitional phase having committed so many men forward. Arda Turan’s goal was the perfect example. Miranda intercepted a loose ball on the edge of the Atleti penalty area and 14 seconds later Arda scored. Swift and merciless. 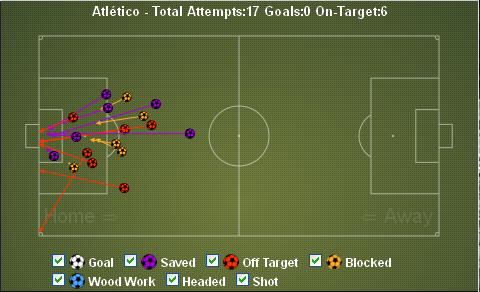 Atleti had 14 attempts at goal with just five on target but all five resulted in goals. Arda Turan in particular enjoyed himself immensely with one goal and two assists before Simeone withdrew him to allow rest ahead of the second leg of the Super Cup in midweek. 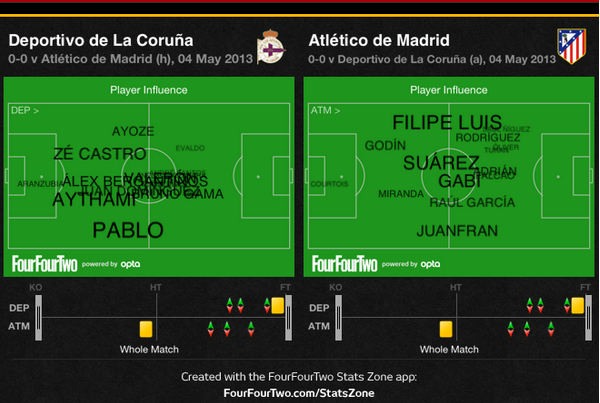 Diego Costa continues to grow as a key player for Atleti too. The discussion around how a post Falcao Atleti would cope seems nonsensical now as the front man continues to deliver goals and performances. Atleti secure 3 league wins in a row for the first time since last November. The professional manner of the victory will please Simeone. It would have been easy to reduce the intensity of their play and coast to a comfortable win but Atleti continued pushing for the full 90 minutes with Villa in particular, desperate to score. It’s still far too early to say with any conviction but this Atleti side look as if they can again push the big two close this season. For the sake of competition within La Liga, hopefully they will. For Rayo, Jemez knows the areas he needs to improve upon. Whether the players are of sufficient quality to undertake these improvements is another issue. He won’t change his ways which means the players will be in for a steep learning curve. Until they come to terms with what is required, expect some high scorelines in Rayo games. The team with the smallest budget in the league will continue to provide entertainment for their own fans and others. Depor vs Atleti – Is the Great Escape Still on? A game at the Riazor on Saturday evening which offered so much and yet delivered so little as both sides played out a fairly uneventful goalless draw. Fernando Vasquez made a number of changes form the side which drew away to Real Betis. Both Silvio and Pizzi were unable to player against their parent club and were replaced by Camunas and Ayoze. With Aguilar unavailable, Bergantinos took his place and Castro started ahead of Kaka in central defence. There were two changes for Atleti with Diego Costa being suspended, his replacement was Adrian. Rodriguez came in for Koke. The change in personnel meant a change in system for Simeone’s men. Movement away from the 4-4-2 which they have utilised recently and back to the 4-2-3-1 which served them so well early in the season with Raul Garcia positioned behind Falcao. Atleti tried to press at times but if they lost possession, they tended to drop off and regain shape. Occasionally they pressed but not with any real conviction. There was an industriousness to Depor with players tracking back and working diligently closing space. The problem though is that when players track back, there is nobody in attack when they win the ball and thus the team were not really able to move high as a unit and exert real pressure on Atleti. One of the important aspects behind Atleti’s success thus far, and particularly, early on in the season has been their ability to control space and limit the opposition from getting too close to their goal. It also means that Atleti are poised to counter attack quickly through short passing. The team sits in two banks of four and becomes difficult to break down. Atleti close opponents down and tackle midway inside their own half. The difference as the season has progressed as been that Atleti have dropped off opponents much quicker to regain shape. 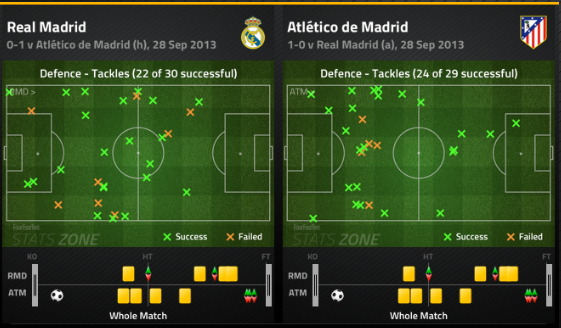 Atleti were making far more tackles in their opponents half of the field. True, Atleti have been more conservative away from home but dropping deeper present a couple of problems. Firstly, it isolates Falcao and moves away from the side being compact and having quick, short passes being interchanged. Secondly, it limits the ability to hit on transitions with much further to travel to the opponents goal. The use of Diego Costa has facilitated this change with the side deeper and hitting more long passes towards the front man for him to pursue into the channels. Strange as it may seem having said that, Atleti could have done with the Brazilian on Saturday evening even if it was just for some of his more unsavoury habits to win up the opposition and gain a slight advantage. 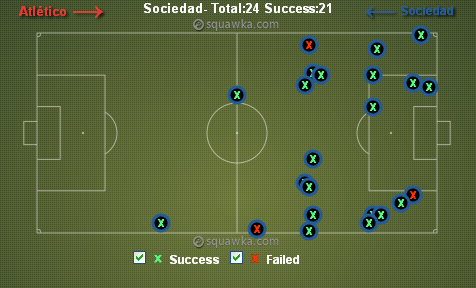 This game was bogged down in the middle of the pitch with neither side really offering any creative outlet. Even Valeron was unable to inspire with the central area so crowded. Godin had Atleti’s best chance in the 27th minute but hesitated and Castro was able to block. Los Rojiblancos could not pressure a nervous looking Depor defence in the early stages of the game with the experienced Aranzubia looking particularly susceptible. Valeron was slightly deeper for a Depor side who clearly missed Aguilar’s ability to recycle possession timeously. Without the Colombian, Bergantinos was an adequate replacement defensively but unable to construct attacks leaving a void to be filled. Camunas could not offer the attacking verve of Pizzi, operating further back with subsequent loss of balance for Depor. These factors combined with the problems which Atleti were experiencing as detailed above and the game moved towards a midfield stalemate and the inevitable scoreless draw. Depor are now undefeated in their last seven league games with four wins and three draws yet this superb run of form has been unable to lift them clear of the relegation zone with surrounding teams also enjoying favourable results. And it’s been three draws in a row now for Depor. Are they losing momentum at the wrong moment? The next two games must see Depor collect points away to Valladolid and at home to Espanyol. After this the Galicians finish with Malaga and Real Sociedad. Teams who will still have something to play for. For Atleti, the season is begging to fizzle out. Simeone must keep his men sharp ahead of the Copa del Rey final and some rotation would not go amiss at this stage. 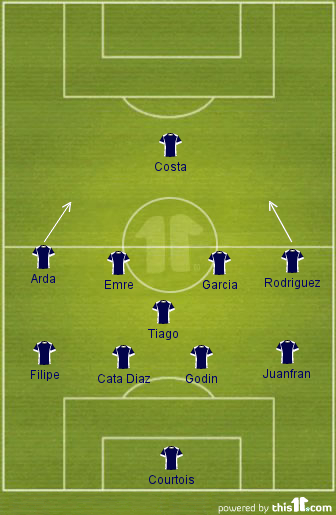 Rotation which could, coincidentally, aid Depor’s Galician neighbours with Atleti facing Celta next. Simeone knows the areas he must address for next season; the lack of creativity from the central area. It’s a tricky situation to get right however as he must find a creative player who can play at the same tempo of the team during transitions and not alter the dynamic. 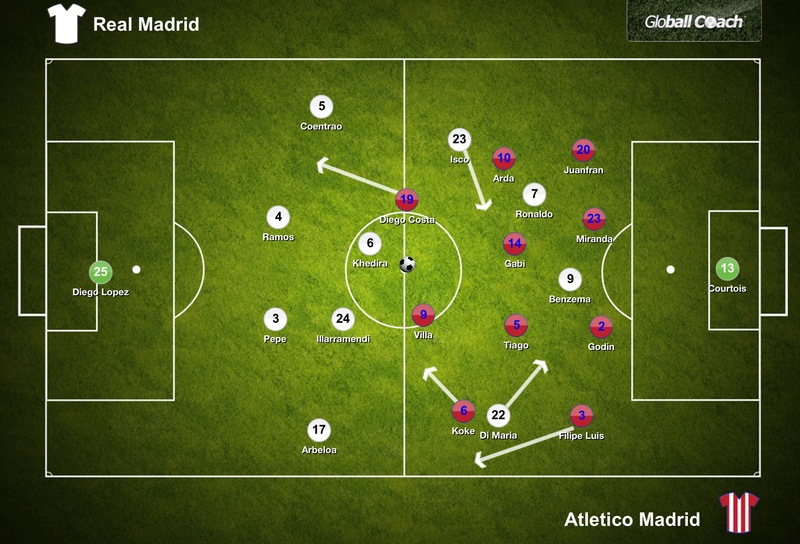 Atleti vs Real – Tactical Analysis – The Real Deal? And they march on, into 4th place in the league. La Real have now won nine, drawn seven and lost just once in their last 17 league games (and they should have managed to avoid that defeat against 10 man Real Madrid) as they climb the league into a position entirely fitting for the quality within the squad. Atleti began and ended the game in 3rd place following Madrid’s win and for the first time this season, they are below their rivals in the league. The last 100% home record in a major European league falls with Atleti suffering their first defeat at home since their cross town opponents arrived and departed with three points late last season. Simeone reinstated Gabi to central midfield following his suspension to be joined by Koke with Mario missing the game due to suspension. Courtois continued in goal with Abel Resino’s 20 year old Atleti domestic record for duration without conceding at home within touching distance. Coutois last conceded a league goal at home in October 2012. The record would eventually fall in the 34th minute and be extended by a further 33 minutes before Prieto struck. 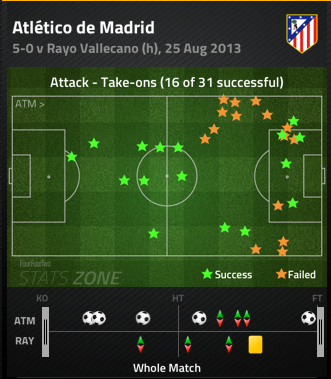 Simeone went with a 4-4-2, Diego Costa supporting Falcao in attack. Montanier moved Aggirexte to the bench including Zurutuza in an advanced midfield role. A move which could be construed as negative depending upon your perspective, Montanier would surely argue it provided the necessary base to begin the game against Atleti. Vela and Griezmann would alternate positions during the game between left wing and striker. Atleti enjoyed better possession early in the game but too often it was in an area of the pitch which could not hurt Real. Aside from a few long range efforts which went wide, the only real threat in the opening stages arrived via the charging runs of Diego Costa, buoyed by his call up to the Brazil squad, moving into the left channel between Carlos Martinez and Mikel Gonzalez. One such run ended abruptly under the challenge of Gonzalez, earning the defender a yellow card. Whilst Atleti would look to start the game strongly, they were able to enjoy possession by an opponent that was content to drop deep, concede possession and only press Atleti as they entered their half of the field. In the 10th minute, Vela, the most advanced Sociedad player, received the ball near the halfway line with no available team mates near him to pass to, eventually conceded a foul. This clearly illustrates just how deep Real sat and how little attacking threat they possessed. It’s a dangerous game to defend so deeply whilst having such little impact on the break. Real possess players with the correct qualities to counter attack but last night was more of a team effort than a few individuals showcasing their ability. All players worked to earn the result. As the first half progressed, Real became more comfortable and allowed their personality to show more, carefully avoiding Atleti pressing with short sharp passing enabling play to switch flanks and attacks to be built. There was still little attacking threat from the Basque’s but the side were moving higher up the pitch and enjoying more possession. They were of course, still wary of the quality of the Atleti counter attack. Part of the success of La Real has been the ability to retain their shape in the face of adversity this season. “To suffer” as Philippe Montanier states but to retain their resolve in such circumstances before triumphing. Their defensive solidity was aided by a well organised offside trap, the line being held around the edge of the penalty area when required preventing Atleti from getting in behind them. The concern for Montanier though was that given how deep Sociedad were defending, when they did get the ball, they were a considerable distance from Courtois and too many players had dropped back to defend. The opportunity for counters was not really in position. The main problem for Atleti last night was their lack of guile and craft to break down an organised and structured defence. Much of the success of Atleti has come from their ability to absorb pressure and counter attack swiftly. A highly efficient reactive side that allows opponents to take the initiative. Last night, Atleti were undone by an opponent using their own game plan. The graphic also highlights the tendency for Atleti to focus their attacks from their left, an area that will be explored. Atleti began the second half with greater intensity to their play, moving the ball quicker and placed the Real defence under some early pressure. With a lack of creativity in the ranks, Atleti often attempted take ons against their opponents but this provided little success either. From 18 takes ons attempted, just six were successful. Too much of the Atleti attack focussed on the left wing with Diego Costa drifting across there and supported by Rodriguez in the first half. The same balance is not found on the right where Arda Turan drifts inward and adopts a central position leaving Juanfran alone on the right to offer width. Although Xabi Prieto scored the solitary goal arriving on the Atleti left, the move began on the Atleti right with Griezmann releasing the pass to Prieto. 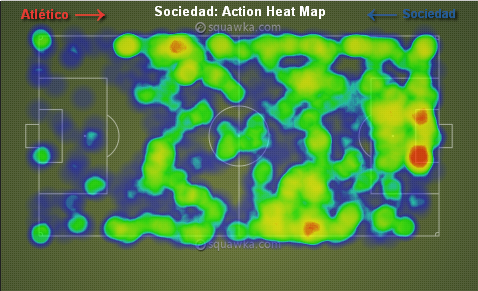 Real Sociedad always had options on their left, the Atleti right, during the game. Simeone made a number of substitutions later on to try and forge a way back int the game but the moves gave Atleti a muddled look with an even greater imbalance on the left prevalent. Play was no longer constructed but revolved around a series of balls into the box or trying to take an opponent on. There was nobody orchestrating play from midfield forward. Nobody probing the Real defence. Simeone will now gain a better understanding of the mental resilience of his players. Having led Madrid all season, they now find themselves playing catch up as the season moves into the final stretch. It also provides glimpse into the future for Atleti under Simeone. Teams will increasingly defend deep against them and force Atleti to take the initiative. 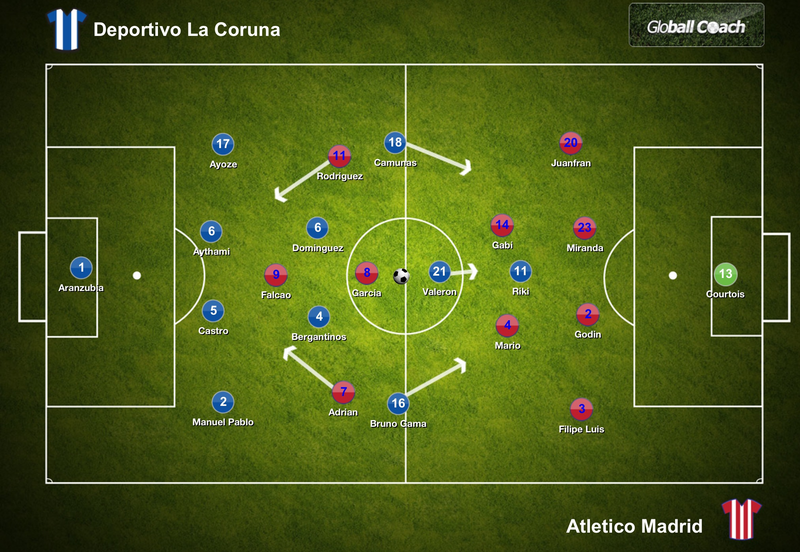 In such games, Simeone must develop alternative strategies in all likelihood aided by a more creative central player. Such a move may disrupt the double pivot which he favours but it could become an invaluable weapon in his arsenal. Real Sociedad began this season with six defeats in their first ten league games but the defeat of Atleti marked their third away win in a row. Montanier has struck the balance, the dividing line between being overly conservative during games and adopting a counter attacking strategy, one in which the players are able to express themselves and display their personality. The final Champions League place is now there for the taking, if La Real can prove they are the real deal. After suffering heavy defeats at the hands of los Rojiblancos over the last year, most notably the 3-0 loss in the Europa League final, Athletic finally got the better of Atleti last night in a comprehensive 3-0 win. This will be scant consolation for the loss in the final but coming amidst a run of poor form for los leones , it’s a very welcome victory and lifts the Basques up the relative security of 12th place in the league. The game is also notable for the clash of styles it brings. The pro-active football of Bielsa against the reactive football of Simeone. With Llorente signing for Juventus on a pre-contract, he was omitted from the squad along with Amorebieta who is also involved in a contract dispute with the club. Simeone had to contend without Falcao following his injury during the home win over Levante last week. Simeone highlighted the fact that this Atleti team could cope without their top scorer. In the eleven games they have played without him, Atleti have scored 16 goals and lost just twice. The loss of Falcao was not the problem for Atleti. The real issue was further back. With club captain Gabi suspended and Mario on the bench, the double pivot that has proven so successful to date was broken up to be replaced by Tiago and Emre. With 25 points separating the teams, both sides entered the game with contrasting recent form. Athletic had drawn once and lost three times in their last four games whilst Atletico have the reverse record; three wins and one draw. Still in the Europa League and the Copa del Rey, it’s now becoming a balancing act for Simeone. Carefully rotate his squad to ensure all members get game time and rest when required. For Athletic, there are no such concerns. Their run to last season’s Europa League final is now a distant memory with elimination at the group phase. The Copa del Rey likewise, lower league Eibar removing any hopes they had there. With a side low on confidence such as Athletic, the question will be raised why Simeone adopted such a conservative game plan from the outset, only really altering it from midway in the second half. 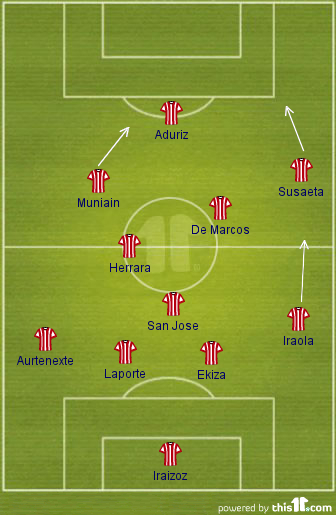 With Athletic under Bielsa, you know exactly what sort of team you will face. One that seeks to press you aggressively high up the pitch, short passing and a team that will seek to overload you on the flanks. Too often this season Athletic have been a pale imitation of the side that performed so admirably last season. The league table does not lie and Athletic find themselves perilously close to the relegation zone. The loss of Llorente is seen as a central tenet of their decline this season yet Aduriz has a better scoring record than his predecessor. The issues which Athletic must confront are in a defence which has conceded an average of 2 goals per game. Last night, Laporte again demonstrated why he is so highly rated at centre back but it was the work of Herrara in midfield, linking play and providing the main creative outlet that was also impressive. With an assist for Susaeta, Herrara produced a good display in a season marked by injury and suspension. The graphic above shows the range of passes made by Herrara across the pitch mainly seeking out the flanks to help Athletic build attacks. Herrara made no failed passes in his own half of the pitch. A testament to his quality but also Atleti’s meek approach. 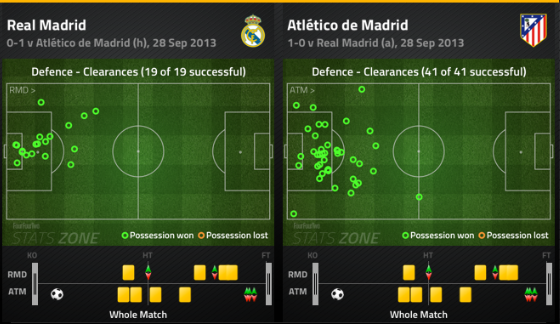 Atleti were positioned too deep for much of this game. Whilst the away game is not as solid as their fantastic record at the Vicente Calderon, Atleti were still too cautious in their approach and allowed Athletic to dictate. The absence of Gabi and Mario was particularly key for Atleti. They reverted to a 4-1-4-1 formation with Tiago being the deepest midfielder with Raul Garcia and Emre ahead of him. Garcia is better in a more advanced position whilst Emre is still adapting to life in the Spanish top flight. 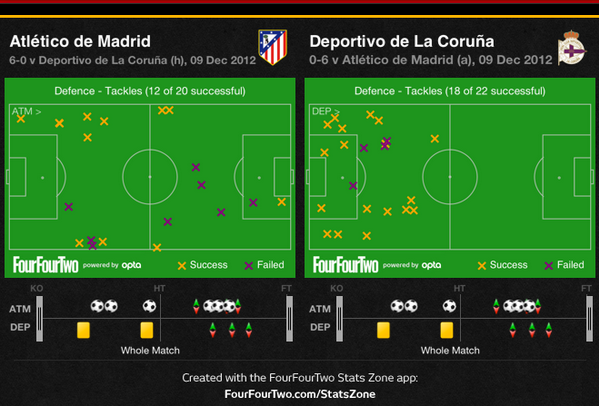 In addition to their deep positioning, Atleti were too slow to engage their opponents. 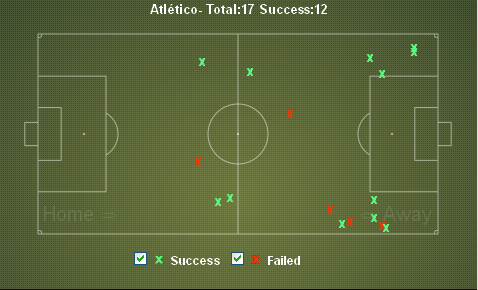 Atleti made just 12 successful tackles from 17 attempted as the graphic below outlines. This contrasts with the hosts making 20 tackles from their 24 attempted. 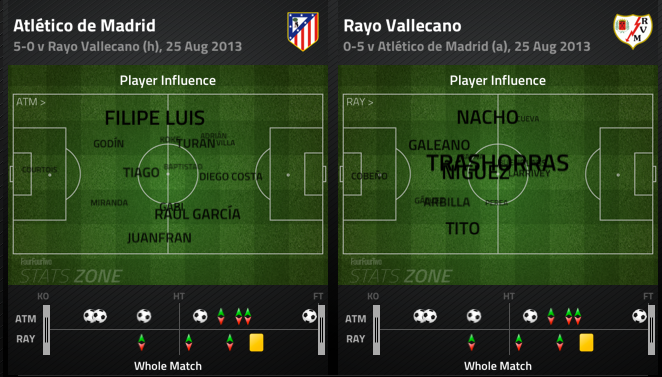 Atleti were allowing their opponents to move too high up the pitch and not controlling space effectively. The high number of tackles on the Atleti left shows just how effective Athletic were at linking play between Iraola, Susaeta and De Marcos on the right. Athletic were able to move into the Atleti half before coming under any pressure. With sharp passing, they were able to evade opponents and hit a number of balls into the Atleti penalty area although these led to few opportunities. THe deep positioning of Atleti also had repercussions when they moved into an attacking phase. Diego Costa was left alone and unsupported too often. 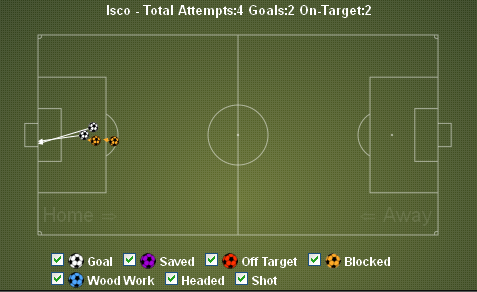 The graphic below shows the Atleti shots at goal during the game. 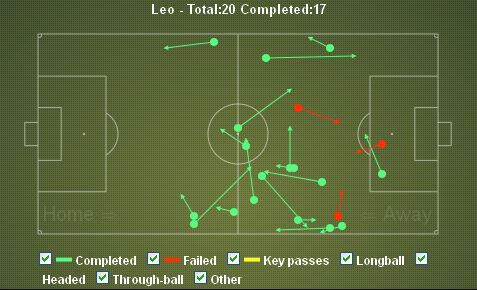 Despite having 17 attempts, too often these were long range efforts or were blocked. 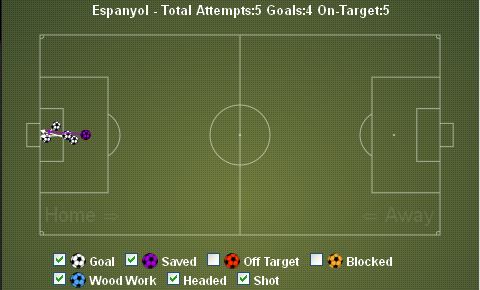 Just six attempts were from within the Athletic penalty area. Diego Costa had no attempts at goal in the game and whilst some may comment on this as proof of his unsuitability to deputise for Falcao,the fact that he was so isolated for much of the game did not help the Brazilian. 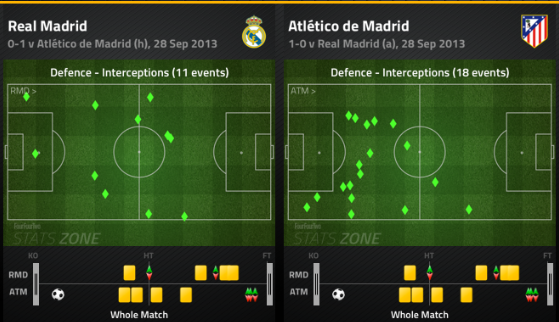 Both Arda and Rodriguez struggled to have any bearing on the game and were too deep to assist their frontman. 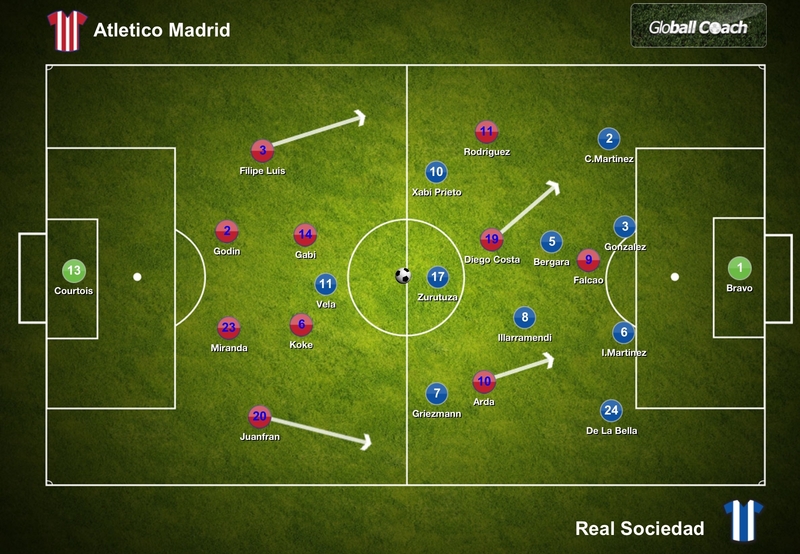 When Atleti did push forward, Juanfran and Filipe seldom joined in the attack leaving the men from Madrid very narrow. Emre should have scored just before half time but Iraizoz saved from close range. This was Atleti’s best chance in the game. The opening goal was very soft from the perspective of los rojiblancos. A corner into the box and San Jose ran off Godin for a free header. In recent meetings, Atleti has picked off Athletic on the counter attack yet last night saw a reverse. 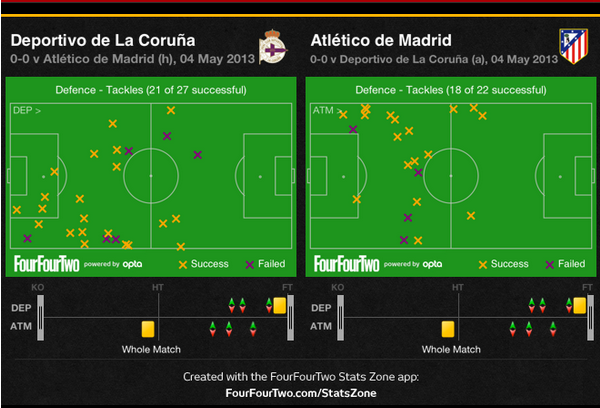 Athletic were still the dominant team but twice they picked off Atleti with swift counter attacking moves. As the game entered the final 20 minutes it became stretched and open, not a situation which Atleti are comfortable with or enjoy. The element of control is removed from their game. Unable to regroup quickly, they conceded two lovely goals during quick transitions to Susaeta and De Marcos. A huge win for Athletic and one which supporters will hope can push the team on, first towards safety and then, with a little luck, perhaps towards the fringes of a Europa League place. As ridiculous as it sounds, it is possible with the side just nine points adrift of Rayo in 6thplace. A substantial loss for Atleti and just Simeone’s 11th defeat in 65 games in charge. There will be plenty of discussion around how this is a one man team etc and the loss of Falcao is too great to overcome. Such comments are wrong and fail to see the bigger picture. 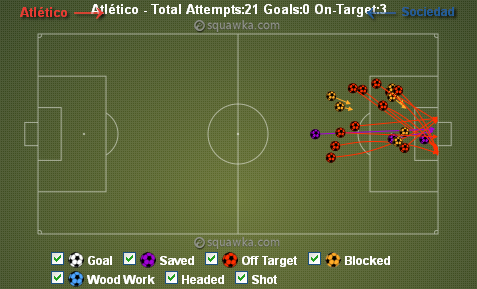 Even with Falcao, Atleti would still have left the San Mames pointless last night.